This great church sits just beyond the inner ring road, on the site of the former city gaol. Four lanes of traffic cut it off from Upper St Giles and the city centre, but as they drop sharply down Grapes Hill they accentuate the position, power and sheer bulk of this magnificent building as it rises above the west side of the city. 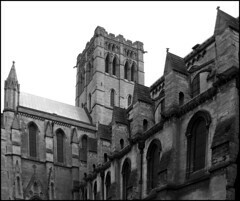 The massive tower seems a fatherly companion to the thirty-odd surviving medieval towers in Norwich, and it may surprise you to learn that it was only completed in 1910. At that date, St John the Baptist was the largest post-Reformation church in England, for this building only became a Cathedral as recently as 1976. 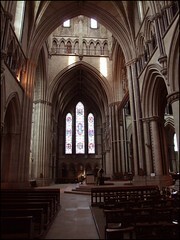 Many people consider it to be the finest Gothic Revival church in the country. These days, the Catholic Church has the largest number of practicing members of any of the Christian Churches in England. It's been that way for several years, and with the recent influx into the country of hundreds of thousands of East Europeans, it is unlikely to change in the near future. It is salutary to remember, then, that it is less than two hundred years since the practice of the Catholic Faith in this country was decriminalised. The Catholic Church had been expelled from England at the time of the Protestant Reformation in the 16th century, and consequently thousands of Catholics suffered grim punishments for their adherence to the faith of their forefathers. Many of the government reformers of the 1540s had wanted to go further, and to establish a fully protestant Church in England without any traditional hierarchy; but the early death of Edward VI, the similarly short reign of Mary, and the Anglican Settlement of the Elizabethan years, ensured that protestantism in England would retain the administrative structures of the banished Catholic Church, and some of the outward aspects of its worship. Mind you, it would be a rocky ride for the Anglicans over the next century or so. Catholicism became increasing irrelevant and marginalised during the long, penal years. In retrospect, this was a good thing. After the furious martyrdoms of the Elizabethan period, the English Catholic community settled into an introspective retreat from public view. During the 17th Century, it would on occasion be forced unwillingly into the glare of controversy by 'Popish plots', real or imagined, but by the 18th century it had become a rare and exotic flower, occasionally encountered, but significant more for its strangeness than for its influence. By the start of the 19th century, there were perhaps less than a thousand Catholics in all East Anglia. During these times, England was treated as a missionary territory by the Catholic Church. In the early years, the Faith was largely maintained and ministered by Jesuits, but by the 18th century there were Vicars Apostolic appointed by the Vatican to carry out the work of Bishops in designated Districts. East Anglia was in the vast Midland District. The work of these proto-Bishops was quite illegal, and they would be arrested if they were caught. Catholics relied for the sacraments on the itinerant Priests maintained by certain large country houses. Catholics in London had access to the chapels of foreign embassies, which welcomed the indigenous Faithful to Mass. It was not permissable for Catholics in England to build their own churches, and there was no right of assembly. However, there were already mission chapels in most towns, which were tolerated as long as the local Catholic community kept a low profile. 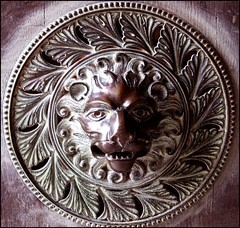 There was one in Norwich in a room in the St Swithin's district, off of St Benedict's Street, run by Jesuits. It was followed soon after by a purpose-built chapel in Maddermarket Street, dedicated to St John the Baptist. In 1780, a Reform Act began the process of decriminalisation; in response, an anti-Catholic pogrom in London, the Gordon Riots, resulted in hundreds of deaths. There was widespread public revulsion against this event, resulting in an increased sympathy for the Catholic community. A few years later, the fear of the French Revolution caused further support for the Catholic minority in England, and this contributed to more reform in the 1820s and 1830s. At last, it was possible for Catholic churches to be built, and for Catholic communities to be formed. 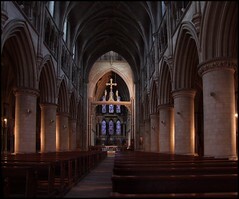 During the 1820s, the first proper Catholic church in Norwich since the Reformation was built. The Holy Apostles Chapel, a grand classical building in Willow Lane, survives as the headquarters of a firm of solicitors. It was ministered by Jesuits. It would be true to say that the Catholic Church in England had become very visible, very quickly, in these early decades of the 19th century. This led to further difficulties, because for the first time in centuries the possible influence of the Church led to a reaction. Would newly-liberated Catholics be loyal to the Crown? 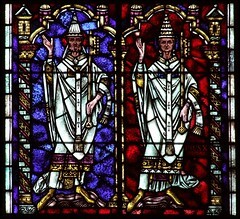 Would a Catholic Church which was given its head threaten the legitimacy of the Church of England? 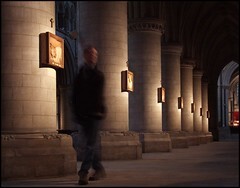 A group of Anglican dons at Oxford University issued a series of tracts in an attempt to assert the primacy of the Church of England as a National Church. The teachings of the Oxford Movement, as it was known, spread like wildfire through the Church of England, turning it upside down, and reinventing it in terms of its medieval past. Anglican parish church buildings became sacramental and liturgical spaces once more, no more the preaching houses they had become under the influence of protestantism. Religion was a popular thing in the middle years of the 19th century. At the time of the 1851 Census of Religious Worship, perhaps one in three of all English people attended an Anglican church service on a Sunday. Many others were drawn to the non-conformist chapels, especially in East Anglia. The Catholic Church barely registers on the radar of the 1851 census, especially in Norfolk and Suffolk. Yet, in a little over 150 years, it would become the largest Church, in terms of attendance. How did this happen? One of the major rites of passage for the newly-legal Catholic Church happened the same year as the census. 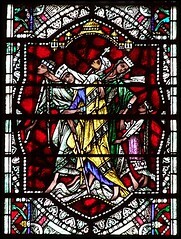 This was the re-establishment of the Church hierarchy in England and Wales. For the first time, there would be a college of Bishops, led by the Archbishop of Westminster, each Bishop having his own diocese. These Catholic dioceses, of course, would overlay those of the Church of England. Because there were far fewer Catholics, the Catholic dioceses were much larger - Norwich was in the vast Diocese of Northampton. 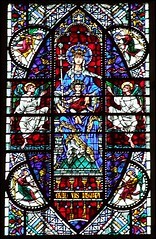 The sees of Catholic dioceses were chosen carefully by the hierarchy; no city which already had an Anglican cathedral would be given a Catholic one, so as not to stir up anti-Catholic feeling. 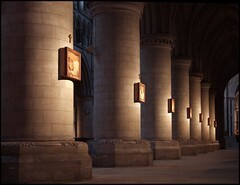 The new Cathedrals were in places of significance to Church history: Southwark and Westminster, Leeds and Middlesbrough, Salford and Clifton. The dioceses were carved up into Catholic parishes, again overlaying the Anglican ones, and again much bigger than their pre-Reformation counterparts. Whereas 16th century Norwich had perhaps 36 Catholic parishes, there was now just one. By 1870, the Holy Apostles Parish had a community of 1,200 Catholics, and a further town centre church followed in Fisher Lane. Yet Norwich was a staunchly protestant town, looking askance on the ritualist movement within the Church of England, and barely tolerating the increasing Catholic presence within its midst. It was the industrialisation of England which had led to the emergence in the 19th century of a large, urban, mainly poor, Catholic population. This sat ill-at-ease with the Country House-led Catholicism of previous generations, but it was often the philanthropy of the landed Catholics which enabled the Catholic Church in urban areas to thrive. 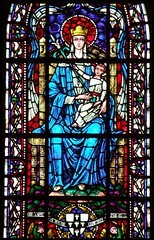 In the 1870s, Our Lady and the English Martyrs, a vast Catholic church, was opened in Cambridge. It had been erected thanks to the fortunes of Mrs Lynne-Stephens of Lynford in Norfolk, and was one of the largest churches built in England in the 19th century. 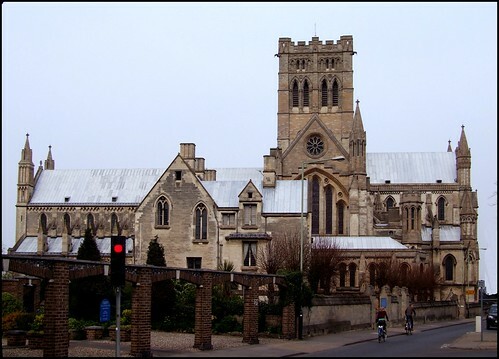 It was clear that if, as seemed likely, the Diocese of Northampton was one day split into two smaller dioceses, the Cambridge church would be ideal as the Cathedral of the new eastern diocese. Cambridge, after all, had no Anglican cathedral, while Norwich did. 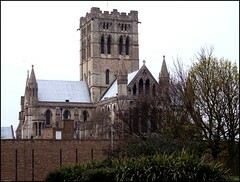 A similarly large church was begun in Ipswich, although it was never completed. All over England, the Catholic communites were becoming more confident, even triumphalist. Larger and larger churches were being erected. And yet, the mood seemed not to have affected Norwich, with its two little Catholic chapels. However, this hedging of bets for the future was complicated by one unusual, but ultimately significant, fact. The leading Catholic family of England then, as now, were the Dukes of Norfolk. The Duke of the day had been very generous with his money towards the building of the Cathedral at Southwark, and was responsible for the building of two great churches at Arundel and Sheffield, two places where the family had great influence. Norwich was a third. 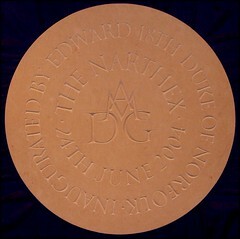 In 1877, Henry Fitzalan Howard, the 15th Duke of Norfolk, married Lady Flora Hastings, and he decided to commemorate the event in stone. In 1892 he would write a letter to the Mayor of Norwich, remembering the occasion. "When, shortly after my most happy marriage, I wished to build a church as a thank-offering to God, many places were suggested to me. 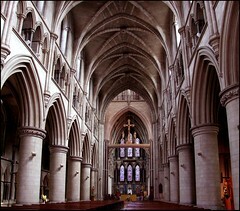 Bearing in mind the title that I hold, I decided to build this church in Norwich, the chief city of Norfolk." A site had been purchased in Coslany, but before any clearance began, the 1827 city gaol came onto the market. This was also bought, and in 1881 the buildings on it were demolished. The Duke selected as architect for the new building George Gilbert Scott Junior, a convert to Catholicism. It would be dedicated to St John the Baptist, in memory of the chapel in Maddermarket Street. The style was to be Early English Gothic. The size would be immense. There seems to have been no competition. The foundation stone was laid on the 17th July 1884. Construction proceeded smoothly until 1892, when it was discovered that there was no planning permission for the full length of the building. This was the occasion for the Duke's letter mentioned in the previous paragraph, throwing himself somewhat on the mercy of the Corporation. "After considerable hesitation", he wrote, "I venture to address you on the subject of the church I am building in Norwich. As you are aware, difficulties have arisen... and I fear that there is danger not only of the city and myself being driven to great expense in litigation, but of its appearing as if I was acting in a hostile spirit towards the Corporation of Norwich in my attempt to add one more to the beauties of their beautiful city. It is this last consideration which chiefly induces me to trouble you with this letter." 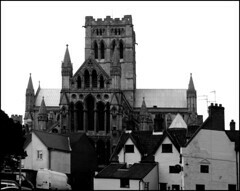 The Duke went on to observe that "I have now built half the church, and I do not think any member of the corporation will suggest that it is a building of which Norwich has any cause to be ashamed... Norwich has got half my church. If it does not want the other half, perhaps I had better build it in some place which will appreciate it more. To me, of course, the result will be a disappointment." This combination of charm and bluff seemed to do the trick, and by 1894 the nave had been completed, and services were moved from the two smaller churches in the parish into St John the Baptist. 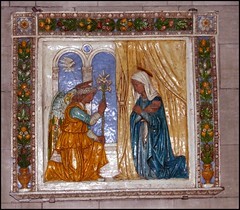 Scott died in 1897, and the work was finished by his brother, John Oldrich Scott. And so, on the Feast of the Immaculate Conception, December 8th 1910, the great church was opened with a Blessing and High Pontifical Mass celebrated by the Bishop of Northampton, Dr Keating. Within the lifetime of people who had known the end of the penal years, the greatest Catholic church in England was complete. 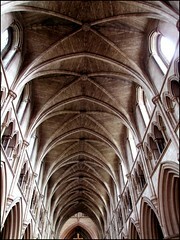 The church is a magnificent, cruciform structure, 275 feet long. 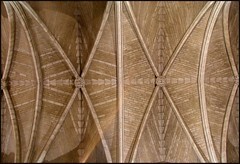 The chancel roof rises to a height of 80 feet, the top of the crossing a further 80 feet above that. Although the harmony and confidence of the Early English style here is perfection, the glory of the cathedral is perhaps not in its stonework at all, but in the extensive scheme of glass by Powell & Son. 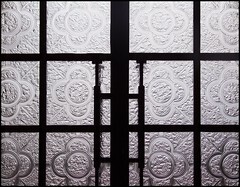 The style is entirely in keeping, entirely traditional. The overwhelming colour is blue, and on a bright day it can be like standing inside of a vast jewel. 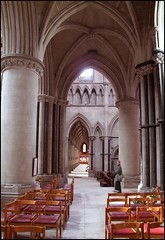 You enter the building through the north porch. On a bright day, it can take a moment to accustom the eyes to the dim light within, although, because of the glass, this church could never be described as gloomy. 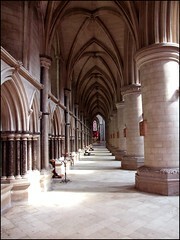 The great arcades lead the eye down the long bays to the light of the crossing, and the sanctuary beyond. 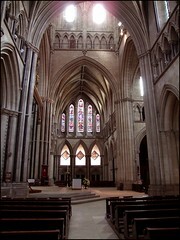 The walls climb high to the triforium and clerestory. 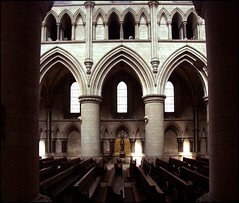 As in all large churches, the nave would be greatly improved if it were cleared of the 19th century benches and these were replaced with modern chairs. But these are not too intrusive, not least because the aisles are clear and punctuated by devotional statues, a pleasing route to walk around the church. Incidentally, it is not unusual to find yourself alone in this vast space. Even today, Norwich has a smaller Catholic population than Cambridge or Ipswich, and you can wander here as if you owned the place in a way which would never be possible in Cambridge's Our Lady and the English Martyrs. This may change when the narthex visitors centre planned for the south-west corner is completed. Work on this is beginning as I write. Beyond the crossing, smaller chapels let eastwards off of the transepts, including the Walsingham Chapel and the chapel of Christian Unity. While the great post-Vatican II altar under the crossing is magnificent, the reordering of the sanctuary is not a happy one, and the building really cries out for the retention of a high altar in addition to the new one. Plans are in hand for this, but the narthex must take priority. Another less happy feature is the tiny modern font at the west end. What is now the shop was originally a baptistry, and the delicious marble font is still in situ, but no longer used for its purpose. The Second Spring of the Catholic Church in England has flourished into a vigorous Summer, and today the Catholic population of East Anglia continues to grow rapidly. 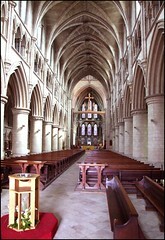 In 1961, an Auxiliary Bishop was appointed to the Diocese of Northampton, with special responsibility for East Anglia. Fifteen years later, on the 13th of March 1976, the Diocese of Northampton was split in two, and the three eastern counties of Cambridgeshire, Norfolk and Suffolk formed the new Diocese of East Anglia. 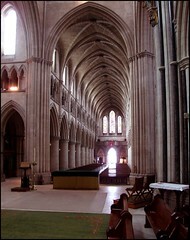 There was never any question that the Cathedral would be here in Norwich. 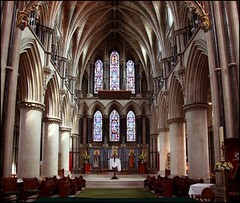 Since the sensitivities of the 19th century, the Church of England had created a number of Cathedrals in cities already served by Catholic Cathedrals, most significantly Birmingham and Liverpool, but in deference to the spirit of those times this Church is always known as the Cathedral of East Anglia, or St John's Cathedral, without any reference to the name of the city. A friend observed to me recently that you could see everything there was to see in St John the Baptist in an hour, while it would take a week for the Anglican Cathedral to give up all its treasures. This is certainly true, and while I would observe that the Anglican Cathedral was itself a Catholic Cathedral once, I would also say that it is a good thing. For, as Bill Wilson observes in the revised edition of Pevsner, this "amazing church... is of course an end and not a beginning". He goes on to describe the style as "self-effacing historicism... with nothing of the new freedom and licence of Sedding or Caroe, i.e. the Arts & Crafts". And amen to that, for here we have the best example in England of a great Gothic Revival church, a perfection of the late Victorian imagination in stone. 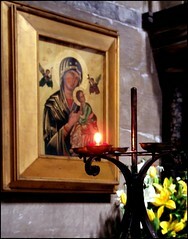 As with its Anglican counterpart, it is certainly a great national treasure.